As we noted in our previous post, we recently hosted a small Hawaiian-themed dinner party for a close friend and made macadamia nut tart. The tart was great, but we wanted to be sure to have a cocktail to match, so we looked no further than Jeff “Beachbum” Berry, probably the world’s biggest expert on Tiki drinks. We happen to have his tiki drink iPhone App (so cool) and looked for a tiki cocktail that would go with dessert. We searched on the keyword “coffee” and after browsing a few results, the Otto’s Grotto almost jumped of the screen. It sounded like a perfect summer “dessert” cocktail. So we gave it a try (of course, we tested it before we served it to our friends.. ;-). 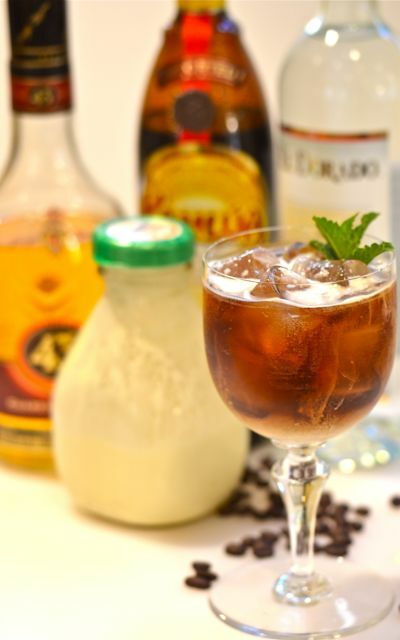 The Otto’s Grotto is a cold drink that features coffee, white rum, coffee liqueur (Kahlua, Tia Maria or home-made), Licor 43 and a dash of heavy cream. But this is not a syrupy white/black russian, but more of an ice-coffee with a kick and some depth. 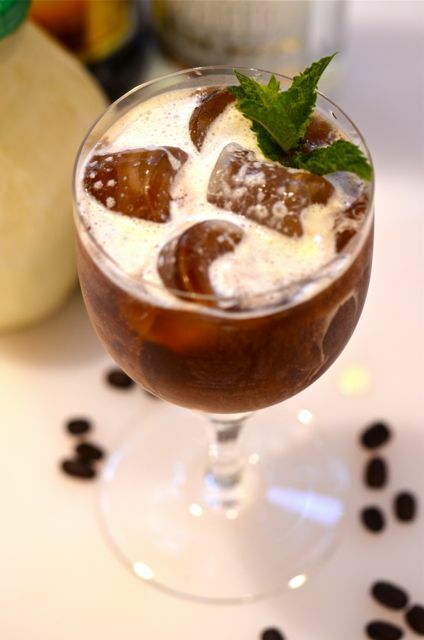 Coffee is clearly the main ingredient, but the rum, coffee liqueur and Licor 43 all add extra flavor. The cream adds a smooth note and mellows the bitterness of the coffee. While we served the Otto’s Grotto for dessert, you could serve this cocktail almost any time of day and get a very welcome reception. It’s good. Float cream on top for a good presentation. As for the ingredients, good coffee is the key here. Great coffee = great coffee cocktail, ’nuff said. As for the other ingredients, this is where you have some flexibility. 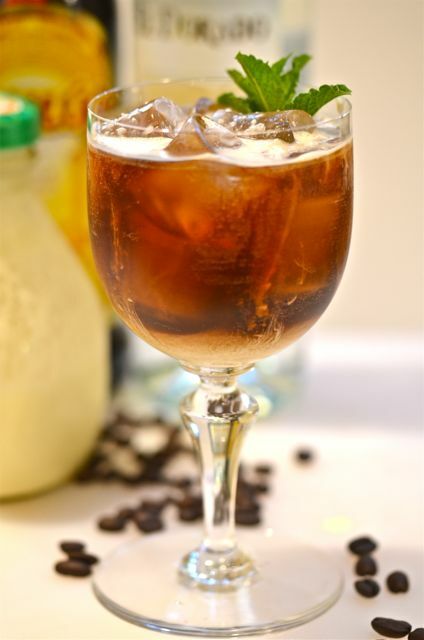 And decent white rum will do, the alcohol will mainly boost the flavor of the coffee. 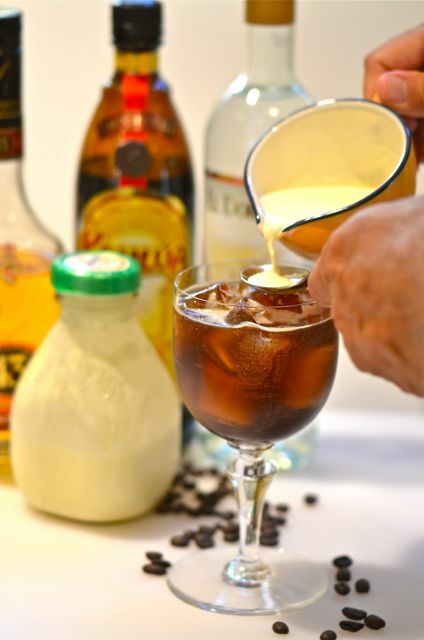 As for the coffee liqueur, we use Kahlua (without shame), but Tia Maria will work. And coffee liqueur is one of the best DIY liqueurs you can make at home, here is a good article on the subject from Marcia Simmons at Serious Eats (they have some really good cocktail writers). Finally we have the Licor 43, a vanilla and citrus liqueur that is sometimes hard to find. We like it in the drink and it is worth having in your bar, but you could substitute Tuaca. And in a pinch, vanilla syrup and an extra dash of rum will work just fine. Building this drink is by no means difficult, but a few little steps will help. Firstly, when you mix the coffee and liqueurs, check for taste. Coffee is a highly variable ingredient, you may want to add an extra dash of coffee liqueur or Licor 43 to balance the flavors. And finally, when adding the heavy cream, it helps to drizzle it on a spoon just above the drink. This will help float the cream on top. While not a necessary step, it will look good. And if a drink tastes this good, you may as well rock the presentation. Happy Friday! Place all the ingredients, except the cream, and ice into a cocktail shaker. Shake thoroughly and pour unstrained into a highball glass or goblet. Float cream. Garnish with a sprig of mint, if you like. Serve.